Rarely do I eat at a restaurant where everything I try I like. Sri Lankan is my new favorite type of food. So far I have tried the Lump Rice, Kottu Roti, Chipatti Roti and Sri Lankan Fried Rice and I hope to try everything else! The owners provide excellent service/guidance if you need help choosing a dish. Maybe the delay in us finding out about this place was due to word of mouth not getting around .......this has nothing to do with the quality more that its hard to put into words how good this place is...... It also could be due to the fact you need a couple of beers to cool your tongue after you order extra spicy Really recommend this place, it's lump rice and spicy coconut are to die for. Have a few dishes to get a real flavour and don't forget the kingfisher beers if you get too hot. The decor adds to the charm but could do with repainting and cleaning the front door and maybe air con however that might have been the spice again. I discovered Sri Lankan food a few years back via a randomly-placed takeaway on Balmoral Road. The familiarity of curry and spices combined with fresh, light and sometimes coconutty flavours was a revelation and the start of a love affair. I was so happy to discover this little cafe in the Sandringham shopping centre and our recent visit was a beautiful thing. The couple that run this place are lovely and will answer any questions about the menu happily and seem genuinely pleased to aid in their customers' discovery of this cuisine. I could rave on and on about how great this place is and it absolutely deserves its rapidly ascending reputation as the next big thing in unpretentious flavoursome local eats. While the menu is a bit overly complex (each dish comes with several other sides and usually more than one curry), they are more than happy to accommodate all manner of dietary requirements, be it gluten-free, vegan, no eggs please or just plain old vegetarian. 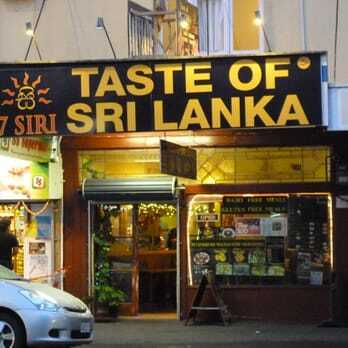 I can't recommend 7 Siri - Taste of Sri Lanka enough (gotta love that name! ), and one of my pet peeves about ethnic eateries is bad lighting - this place is adorned in fairy lights and is a very pleasant place for a simple but sensational dinner.